The National Geographic channel will air a documentary on the ill-fated ocean liner on July 15. A NEW NATIONAL Geographic documentary will explore what led to the sinking of the Lusitania ocean liner in 1915. Dark Secrets of the Lusitania is due to be shown on Sunday 15 July at 7pm on the National Geographic Channel. It will explore the reports of an illegal cargo of weapons that were alleged to have been on board the liner – did they cause a second blast on board? The Lusitania sank 11 miles off the Old Head of Kinsale on the 7 May 1915 after being attacked and struck by a torpedo fired by a German submarine U-20. After a second explosion, it took just 18 minutes for the vessel to sink, causing the deaths of 1,198 people. The British claimed that it was due to a second torpedo while Germany in refuting the claim maintained that the cause was due to the explosion of gun-cotton and or other explosive material that the liner was clandestinely carrying. 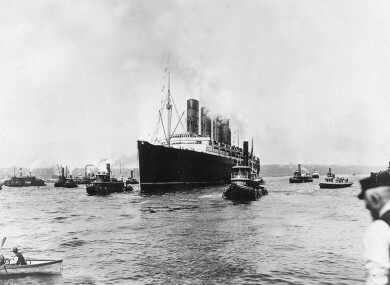 Germany regarded the Lusitania as a legitimate target as the ship was on the British navy list and carried millions of rounds of .303 ammunition. The death of the 128 American passengers in the tragedy is regarded by many as one of the major reasons why the US entered World War I. The documentary uses lab research into explosive theories, dives in high seas and the recorded testimony of survivors to take another look at the sinking. According to the National Geographic, the divers risked their lives by exploring the ghostly wreck. An inquest was held into the sinking just three days after the incident, during which it was claimed that all ships in the area had been made aware of the threat of torpedoes, but the captain William Turner did not follow the warning. Today, the ship lies 90 metres below the water, 25 nautical miles from the Old Head of Kinsale. Email “Lusitania's 'dark secrets' unveiled in new documentary”. Feedback on “Lusitania's 'dark secrets' unveiled in new documentary”.